QuantumLook promises to help you “leap through the Web”, but it is very doubtful whether this application can keep its promises. It is an adware program, and it means that the main reason QuantumLook enters your computer is money. It will not try to infect you with malware on purpose, but whenever you have an adware program on board you can be sure that you will encounter a number of potential security threats. Hence, you have to remove QuantumLook and all the other programs that might be detrimental to your PC’s security immediately. You might say that you do not remember installing QuantumLook onto your computer, but it is true that this application does not enter your system surreptitiously. Users always trigger the installation of this adware program even if they are not aware of that. According to our security specialists, QuantumLook always comes bundled with third-party installers and downloaders. It is not surprising considering that QuantumLook is an adware program from SuperWeb family. Adware applications from this group usually have fake official websites that do not provide direct download links, and they are usually bundled with freeware. The same applies to QuantumLook as well. We can access its official homepage at QuantumLook.co, but you will see that clicking the Star Now button only opens a blank new tab. What is more, the official website claims that this plug-in is compatible with all the main browsers, but the newest Google Chrome versions are no longer affected by QuantumLook. However, if you use Google Chrome as your default browser, it does not mean that you cannot be infected with this adware application – it can still enter your computer! QuantumLook has its own setup, so if you are attentive enough during freeware installation, you will notice that additional software wants to enter the PC. 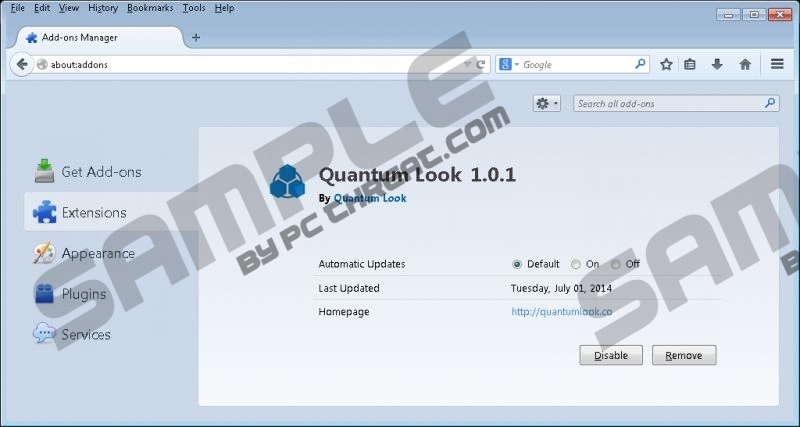 It says that QuantumLook “adds helpful features and content to enhance your web browsing experience. Quantum Look provides website ratings and reviews, multi-site searching, special deals, related search results, and comparison shopping.” It does sound nice, but the question is whether the application can do everything it promises. Based on our research, QuantumLook constantly displays banner ads in supported websites, and it floods you with annoying shopping suggestions on popular online shopping webpages (for example, ebay.com, bestbuy.com, amazon.com, etc.). These shopping suggestions can be embedded with links to potentially dangerous websites because QuantumLook does not review the third-party content it promotes. In other words – you need to uninstall QuantumLook from your computer in order to avoid a list of potential computer security threats. Even if this program does not try to infect you with malware, it does not mean that other malevolent third parties will not try to do it. After manual removal, be sure to scan your system with SpyHunter free scanner because you need to terminate all the other unwanted applications as well. For any further questions, do not hesitate to leave us a comment. Highlight Quantum Look and click Uninstall. Go to Uninstall a program and remove Quantum Look. Select Add or remove programs and uninstall Quantum Look. Quick & tested solution for QuantumLook removal.